Over Christmas I received a bird cookie cutter, and have been dying to use it ever since. 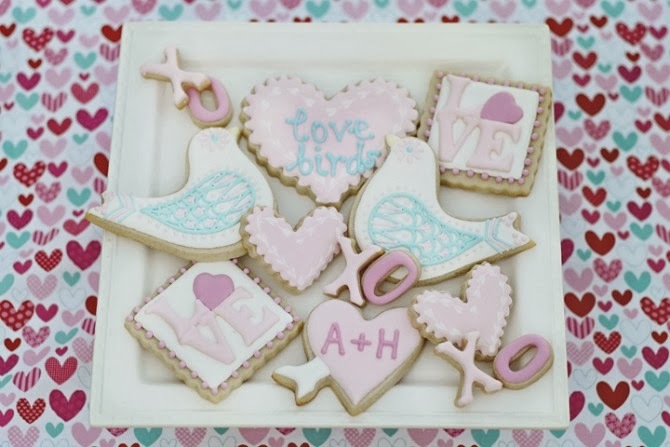 With Valentine's Day right around the corner, I thought a "Love Birds" set would be really cute. Remembering some really neat Czech folk art that we had seen on a trip to Oklahoma last year, I decided to use that as inspiration for this sweet blue and pink cookie set. Most of the cookies were pretty straight forward. I usually draw out my designs so that I know where I'm headed, and that certainly helped with some of the detail on the bird. 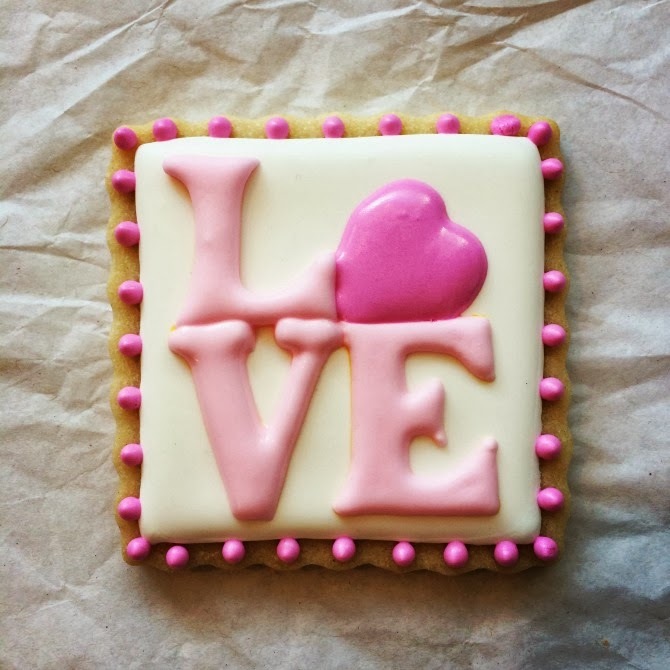 But it was the LOVE cookie that I wasn't quite sure how to approach. I follow a lot of cookie decorator blogs, and have watched my fair share of tutorials, but haven't strayed much from the traditional pipe and flood method. 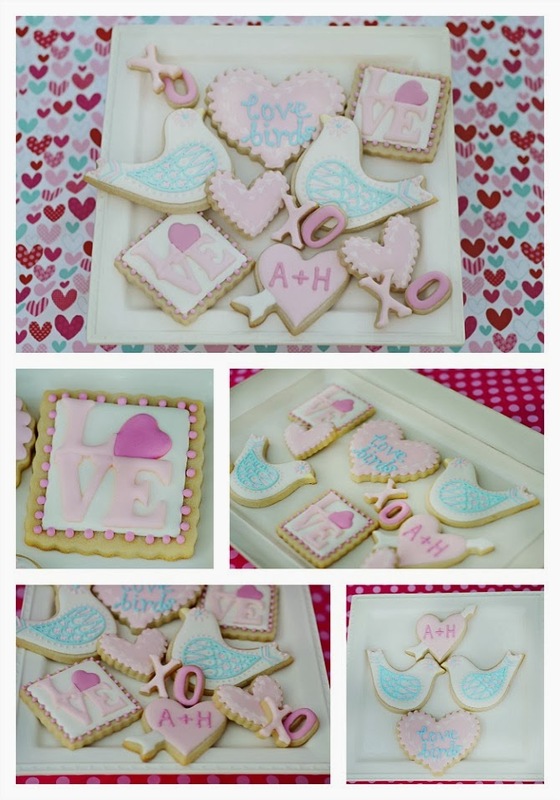 So the LOVE cookie was the perfect opportunity to try out a transfer method that I had seen via the brilliant SweetAmbs blog and tutorial. I wanted the letters to be perfect, and wasn't sure that drawing them out directly on the cookie would get me there. The idea behind the tissue paper transfer method is pretty simple. 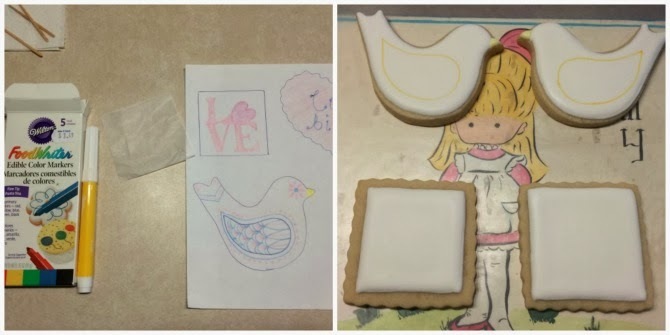 All you need is a dried cookie, tissue paper, an edible marker, and the design/text you want to use. Step 2: Trace the design on the piece of tissue paper, using an edible marker. Place that tissue on top of your blank cookie, and trace the letters again- pressing hard enough for the marker to seep through. Remove tissue paper. Step 3: Use your piping bag or bottle to outline and fill in the design. In this case, I did the opposite letters first and let them dry before doing the rest. This kept definitive lines between them. That's it! Obviously not an ideal method if you're doing dozens of cookies- but I'm just not there yet. So for now, this allows me to get <nearly> perfect letters or designs on a few cookies that I add to a set. Again- brilliant! I'm really happy with how this set turned out, and especially loved the color combo. Blue and pink just looks so pretty together. I also have to give a big thank you to my talented friend and neighbor, Studio Mama B., who took the pretty pictures of the finished set. I've been torturing you all with ugly iPhone pictures, so it's nice to have some that look way more professional. Thank you Caroline!! 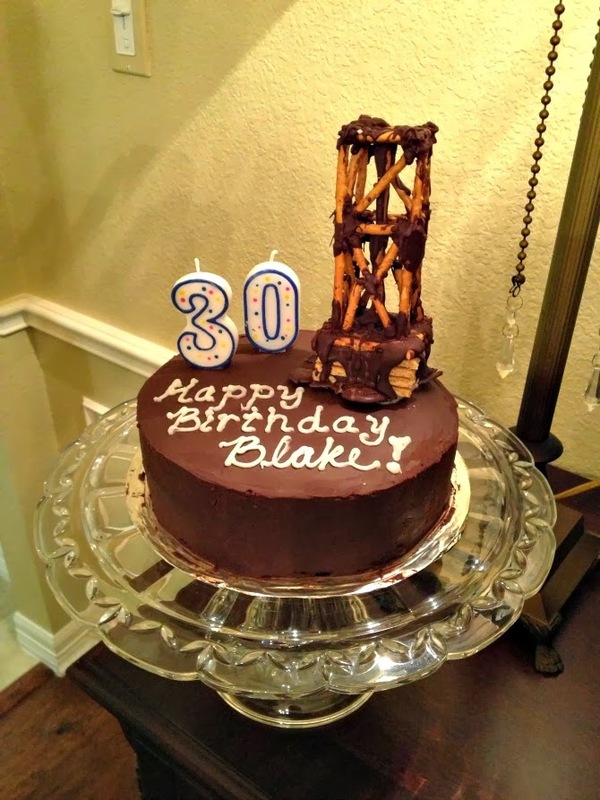 We celebrated Hank's 39th birthday over the weekend. His actual birthday was Friday, but we usually lay low Friday nights since we get up super early for long runs on Saturday. I brought home Chinese take-out and we watched a movie. Poor guy didn't even get a special dessert from his baker wife. But I did have some fun things planned for the weekend. 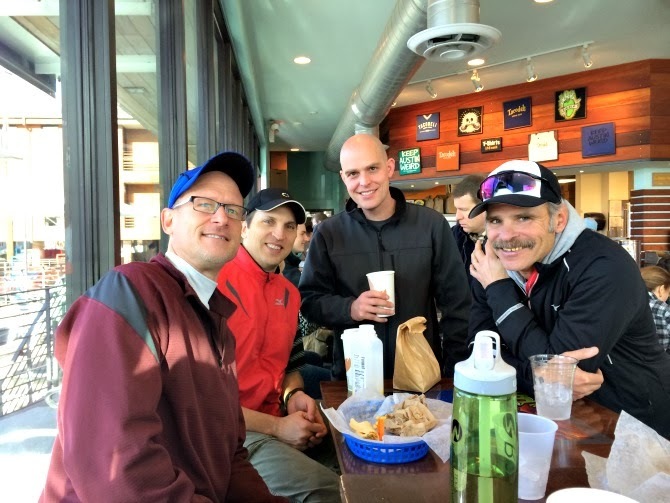 About 20 friends met up for a post-run breakfast at our usual spot Taco Deli. After an afternoon of relaxing (I didn't even make him work on our painting project that afternoon) we met up with more friends for dinner at Haymaker on Saturday night. We don't get out as much anymore, so I wanted to take him somewhere fun and different. 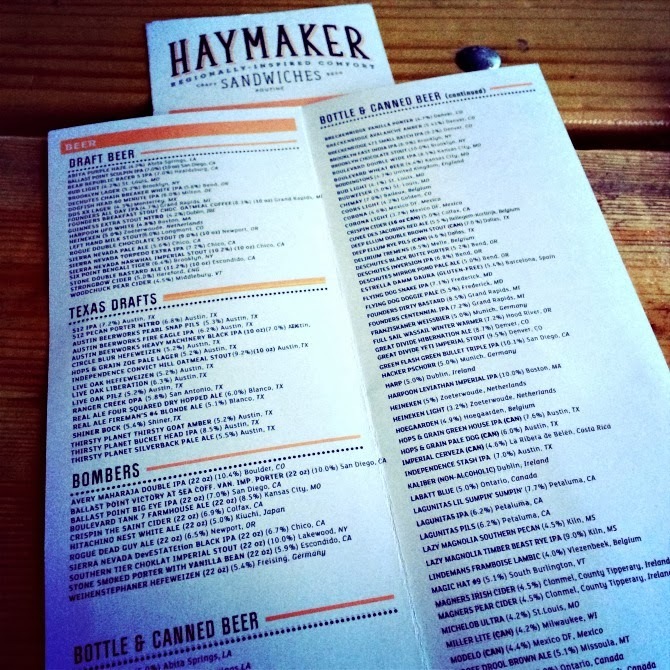 This place was fairly new, and everything that I read about it pointed towards a ridiculously good beer menu, including a lot of local labels and good craft beer. Done and done! The food only got moderate reviews, but I figured worst case scenario we'd get some apps and a few drinks, and then head elsewhere. After browsing the menu, it looked like the apps alone could make a great meal, so I really didn't worry about it. 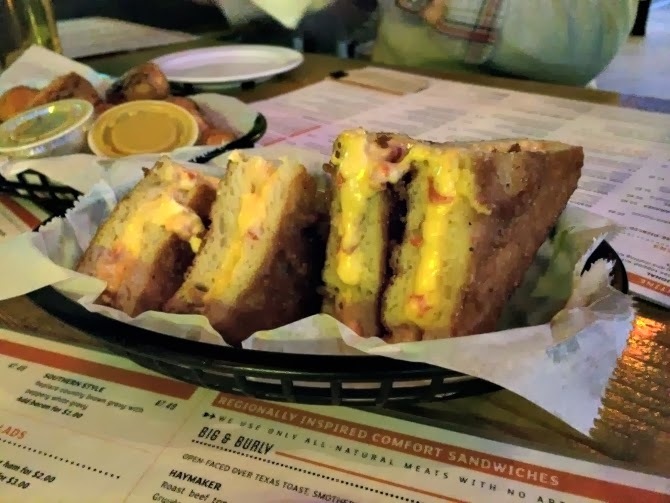 Touted as "regionally-inspired comfort food", the menu contained items like pretzel bites with house made mustard, beer cheese with kettle chips, and the mother of all apps- the pimiento cheese cristo. Homemade pimiento cheese on white bread, beer battered and fried. I consider myself a connoisseur of pimiento cheese, so I absolutely had to order this. We weren't disappointed. It was the perfect size for 4- each of us got our own little triangle. I wasn't sure what to expect as far as the amount of breading. But it was almost like an extra crispy grilled cheese. The layer of beer-battered goodness on the outside of the bread really took this sandwich up about twenty notches. It had a great tangy flavor, and the pimiento on the inside was equally as good. I could have been done right then and there. More friends joined and we proceeded to order dinner- everyone choosing something from their variety of sandwiches. I'm not sure why I picked a patty melt, but for some reason it sounded good. And it was good- but I have been eating pretty healthy, so I think the overload of grease and cheese just didn't seem as appealing. I only ate half of mine (along with some house made kettle chips), and I was done for the night. Overall I'd give the food a B++, and that's only because this isn't a place you go to for a "healthy" meal. But the quality of the ingredients was good, and I thought the menu had a nice variety of items. We'll definitely be going back. As far as atmosphere goes, this really is a "neighborhood" bar. It has a big (heated) patio out back, and several different seating areas inside. There are TVs for sports (though it's not a sports bar), several pool tables, and yet it is also kid friendly. We saw several young couples out with babies and children. I think it's awesome to have a cool place to go where it's totally ok to take your kids. Overall I think Hank enjoyed his birthday, and we had a really fun weekend. 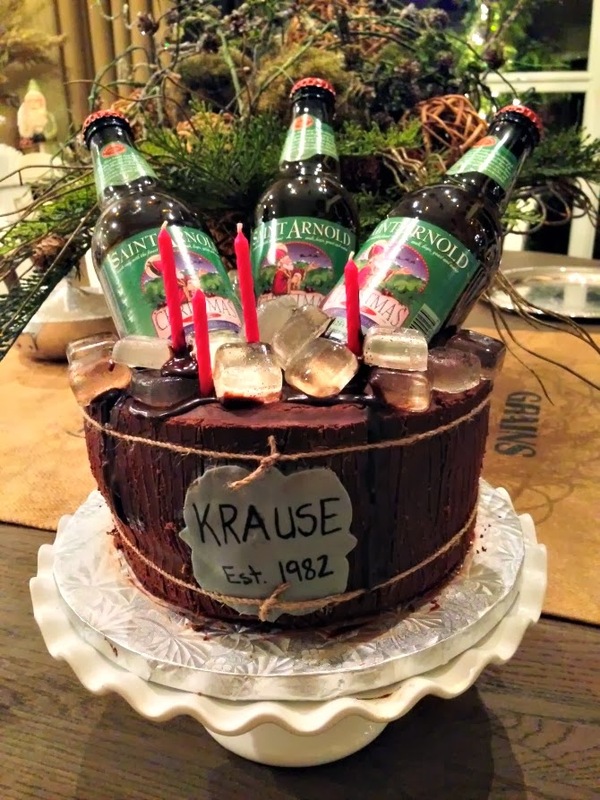 I wish I knew who to give credit to for this delicious, creamy concoction. All I know is that someone served it at a party once, proclaiming it to be the best 3-ingredient dip ever. And who am I to disagree? This is my go-to dip for just about any sporting event viewed on TV. 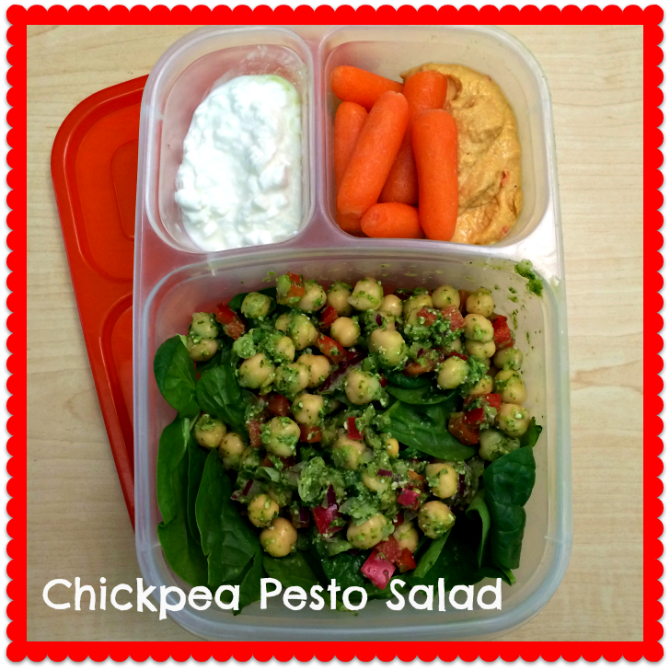 It's inexpensive to make (under $10), easy to put together, and always a crowd pleaser. I recommend doubling the recipe if you have over 6 people, and half of them are guys. Also, be sure to grab the sage sausage. Plain would probably work, but I think the sage is the "secret" ingredient in this dip. 1. Brown sausage over medium heat, breaking into crumbles with a spatula until cooked through. 2. Drain sausage crumbles and return to pan. 3. Add Rotel and cream cheese, stirring until cheese is melted. 4. 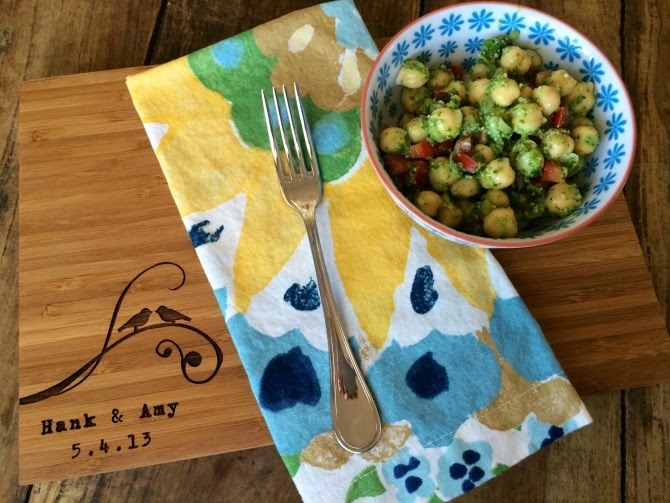 Serve with a bag of chips and watch it disappear. 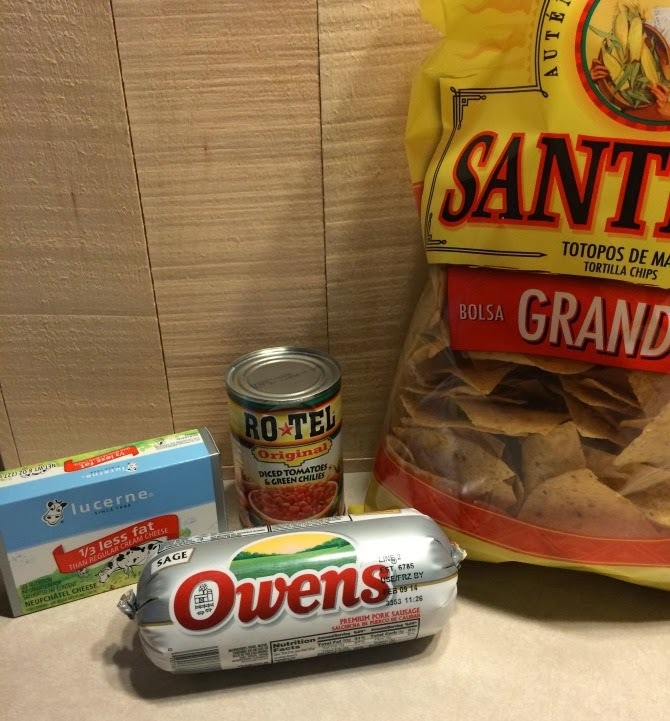 *note: If you live in a place where there is no Rotel, I am so sorry for you. No really- we Texans could simply not survive without it. 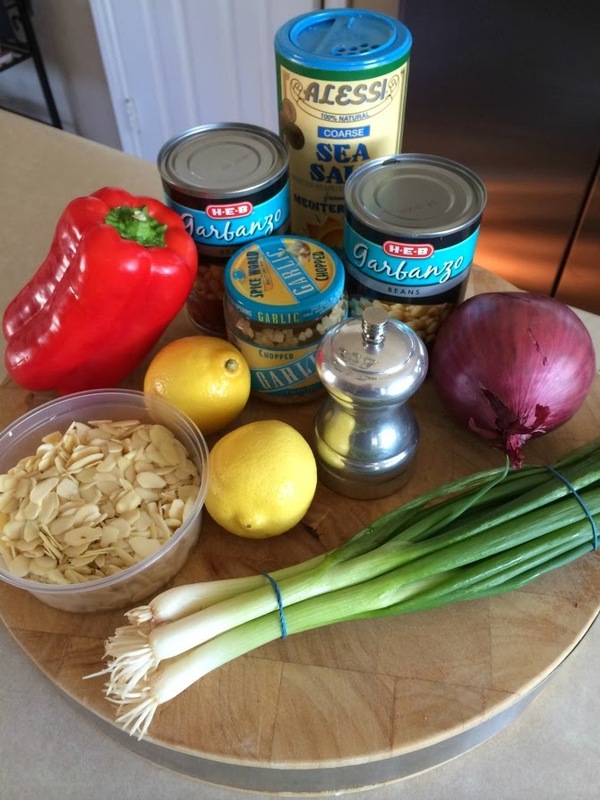 It's possible that you could substitute one can of diced tomatoes mixed with a small can of chopped green chilies. Or you could just email me and ask nicely for me to send a few cans. I just pity the person who has to go through life never experiencing the greatness that is Rotel. 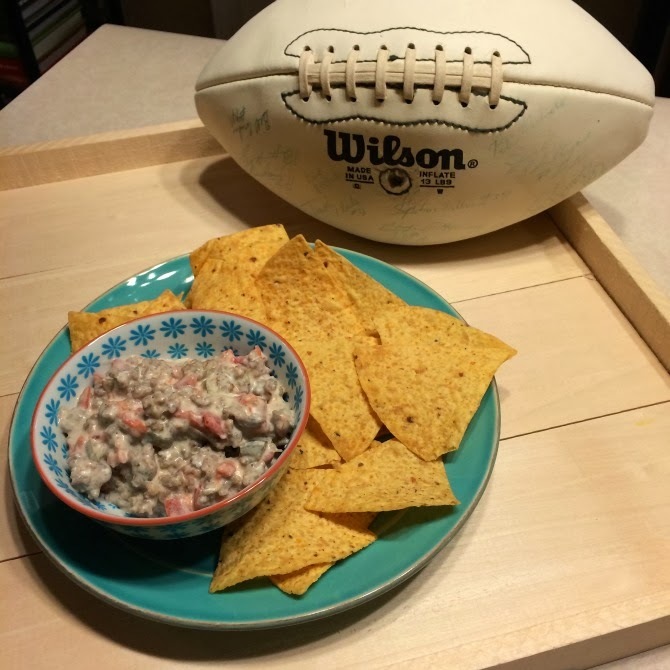 Do you have a go-to dip or party food that you love to serve on game day? It's totally ok to write a weekend recap on a Tuesday night, right? Especially if it involves the world's cutest 13 month old and meatloaf?! We had a fun weekend and I just couldn't go without bragging about the fact that we babysat a 13 month old (and kept her safe, happy, fed AND clean) for a whole 7 hours. And this was AFTER I ran 10 miles. It's a modern day miracle. Our neighbors and good friends down the street ask us to babysit on occasion (I swore to them that we were more than capable of doing so), and they had a day wedding to attend this past Saturday. I had already committed us to a baby shower for the afternoon, so when she asked if we could help with Kaia, I told her only if it was ok for her to go with us. Like I said, we've babysat her multiple times and she loves us. But we're mostly there when it's her bedtime, and hardly ever have to do a thing except check the monitor to make sure she's still in her crib. This time she was awake the whole 7 hours that we were in charge, and we had to transport her, watch over her, and generally just keep her happy (which is a super easy thing to do). She was an angel the whole time, had fun playing with the other kids at the shower, and by the time we got her home, fed and changed her, she went straight to bed without a fuss. I told Hank if I knew that we would have a baby exactly like Kaia, I'd do it in a heartbeat. She made US look good, she's just that easy of a baby. We had a great time though, but man- being a "parent" is definitely a lot of work. We're just not used to being out in public while also being responsible for another human being. We slept in on Sunday, and then I made my weekly trip to the grocery store and got to work on cooking a souther Sunday supper. We had invited two friends over who I love cooking for. Since Hank rarely gets meat, I decided to do a manly meatloaf with mashed potatoes and fried okra. Sunday suppers aren't supposed to be healthy, right? I'm not much of a meatloaf fan, but I wanted to do my best to recreate the delicious one that I had on our trip to Nashville. It was so moist and tangy! After browsing a few recipes online, I decided to consult my cookbook collection and found a recipe in Ruhlman's Twenty. This book focuses on the 20 techniques needed to be a successful cook. Chapter 3 is on water. And you're probably wondering what that has to do with meatloaf. But I'm here to offer you a life altering tidbit if you like to eat meatloaf, but struggle with keeping it moist. You put it in a loaf pan as usual, but you put that pan in a larger/deeper roasting pan and then fill it with water. You cook the meatloaf in a water bath! Brilliant, I tell you. I'm not going to lie and say it was an easy process, but it was totally worth the work, including the homemade chipotle ketchup. The guys loved it! You can't have a Sunday supper without serving dessert, and I used the guys as my guinea pig for a Salted Caramel Chocolate Tart from another new cookbook. It was the only thing that I took a picture of because honestly, meatloaf and mashed potatoes are NOT pretty. 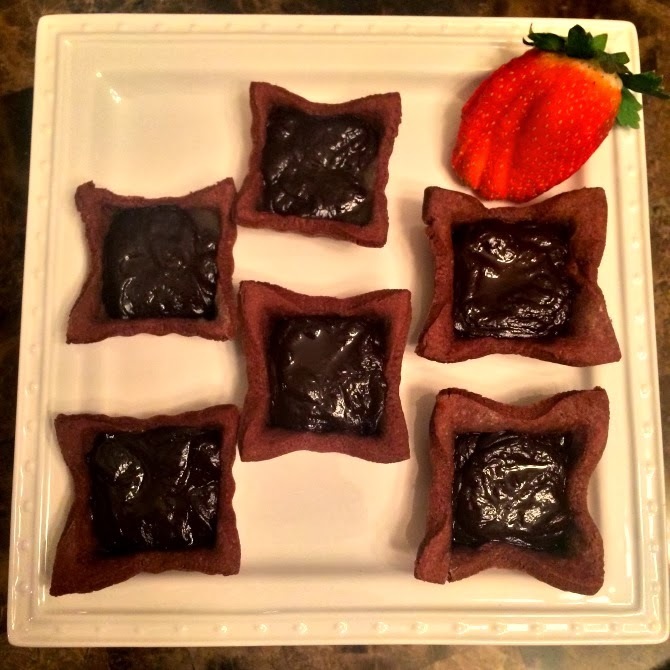 The tarts were delicious, and I will definitely be making them again. It has been two years since I ran my first (and only) half marathon. While it was not a terrible experience, it certainly didn't go as well as planned. I got injured about 6 weeks out, and my training was very limited. In fact, my longest run heading into the race was only 9 miles long. But... I did it! I even finished with a respectable time of 2:15:39. Since that race, my running has been sporadic to say the least. I needed a break. I just didn't plan for that break to be almost a year. In that time, there has been a serious change in my body, and not one for the best. I knew if I was ever going to find a way to get my fitness (and body) back, I would need to put something on the calendar to hold me accountable and to stay motivated. I wanted a challenge. And so another half-marathon it is. I'm officially signed up for the Austin Half-Marathon on Feb. 16. Training has been going well, considering I really didn't start getting more disciplined until about a month ago. I didn't run as much as I wanted to over the holiday, but I did manage to fit in an 8 mile run when we were in Oklahoma. Typically I do longer runs with my friend Nikki, but I didn't have that option. I sucked it up, and actually clocked my fastest time at that distance all on my own. It felt awesome! Now that holidays are over and we're back to reality, I did a great job of sticking to a schedule this week. I did two kettle bell work outs, and ran 9 miles (all at a sub 10:00 min pace). Tomorrow morning I have a 10 mile (hilly) run with Nikki, and I'm actually looking forward to it. The weather should be nice, and it will feel good to find a steady pace that we can sustain for the upcoming race. How many weeks make a habit? I know it's more than one, and I need to stay patient, positive, and motivated if I'm ever going to make the changes I so desperately want. That means one step at a time, literally, and working hard to make good decisions about what I put into my body. I don't want to count calories, and I don't want to cut all fun things out of my diet. I just need to be smart. This week was a good one, and I think it's important to at least stop for a second to acknowledge it. It feels good to feel like a runner again. I realize that I'm officially a day late in putting together an end-of-year post, but we've been spending time with family (in Texas and Oklahoma) for Christmas and I'm just now getting some down time. What a great year 2013 was. Highlights include our wedding, an amazing trip to Nevis, adopting Brees, welcoming our nephew, and starting some home improvement projects. While 2014 is off to a shaky start (I'm sick, and we found out our water heater needs replacing), I have no doubt it will be yet another great year. I did my best to put together a quick year in review in pictures. While I remember doing so many more things, the pictures seem to be heavy on our 5 animals. Go figure! I hope that everyone had a fun and safe New Years. 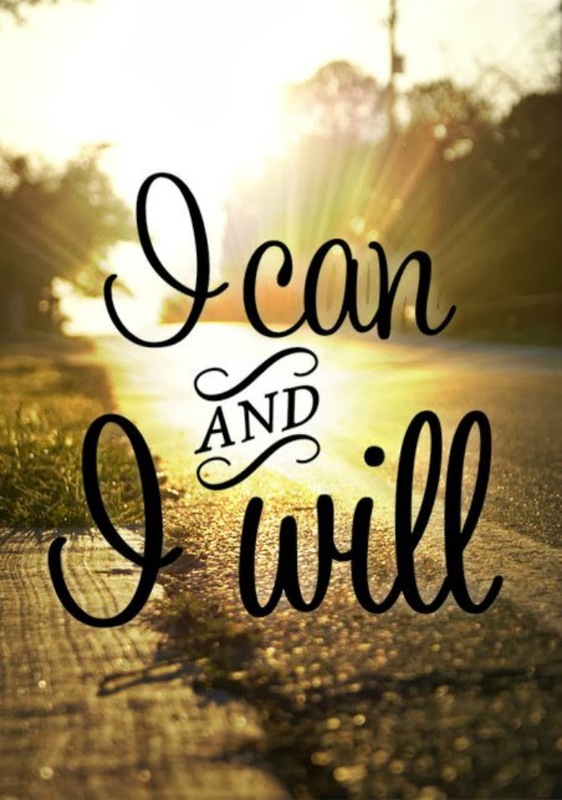 I'm still working on some goals for the year, starting with a half marathon in February. I'd love to hear any of yours if you've already gotten a head start on it.